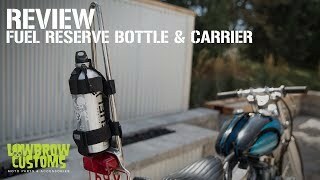 The Lowbrow Fuel Reserve Bottle Carrier, sold separately, is a convenient and low-cost way to secure your fuel bottle during your travels. You can also buy a Lowbrow Customs Fuel Reserve Bottle and Carrier Combo as a set and save yourselves some dough! I always carry an extra quart can of gas with me, when I ride, just in case I can't find a gas station. I was using an empty can from another product but these have a more secure lid. My wife made quilted/padded wraps for them so they don't get all scratched up in the saddle bags. Great and wise product I carried along riding my 48 sportster with only that 2.1 gallon fuel tank. This 30 extra oz. Gets me an extra 24 some miles it's keeps well sealed looks great and a great size and style that fits great in any side saddle bag. are these bottles safe enough to carry and drink water out of? dont really want it for gas, just beer,, i mean water,, for sometime riding. Is the mouth of the bottle large enough to fill directly from the pump at the gas station?